Detroit - Michigan Central Junction Yard. 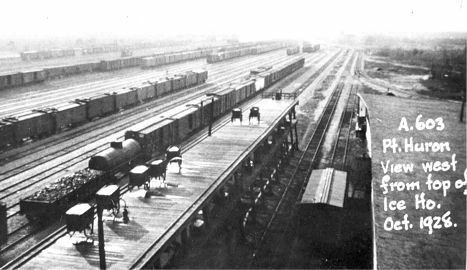 A large icing facility for railroad refrigerated box cars. Located on the property south of the MCRR main line, between Greenfield Road on the west, and Miller Road on the east. This is the triangle area bordering the main line, the junction yard branch, and the old and new wye to Town Line. Operations here likely began about 1900 and operated through the 1950's. Elberta - Ann Arbor Railroad. The AA apparently had an ice house in operation at Elberta which was reported to be located east of the roundhouse. Niles - Michigan Central. This icing opration was build and operated by the MC in their yard here. [Gary Schoenleber] This building still stands as of 2002. 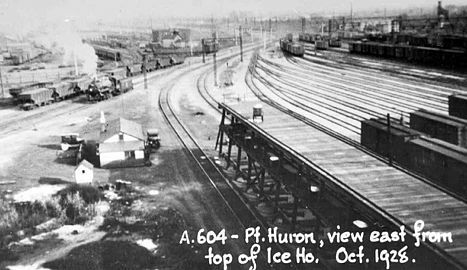 Port Huron - Grand Trunk Western. See the photos below.